There's nothing like blooms on fruit trees in early spring! Mexican Flowering Plum might not be the first tree you think of when planting a fruit tree, but don't overlook it. This native plum is a great ornamental/fruit/flowering tree. Probably the most notable thing about these trees are their white blooms in early spring. They are fragrant and a good source of food for bees and other pollinators. Dark red/purple fruit appears soon after and ripens in the fall. The fruit is loved by birds, but you'll like it too. That is, if you like making jams or pies. The skin of these plums is very thick, so it's not as easy to eat fresh like other plums. Mexican Flowering Plums are relatively small trees with a single trunk. Growing 15-30 feet tall and about 25 feet wide at maturity, it can fit into most yards. It's also considered slow growing, so it will take a while to use up the space. Their branches are thin and spreading and when mature, the blue-gray bark starts to peel and almost appears striped. Watch out, the branches are also a little bit thorny! In summer, this tree will have olive green, thick, sand papery leaves. In fall you can expect a yellow to orange color before they drop. Mexican Plums are easy to grow and have very few pest or disease problems. Plant in full sun to part shade. These can be used as an understory tree as well. 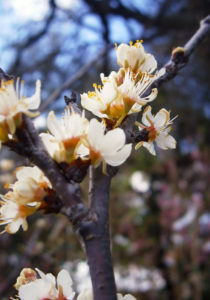 Mexican Flowering Plum can tolerate a variety of soils from acidic to alkaline, clay to well drained. 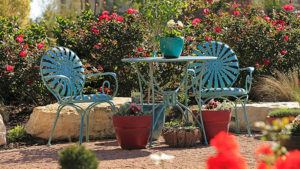 Once established, these native trees are drought tolerant. Hurry in to The Garden Center and grab yours this spring, we only have a handful available! Calamondin Orange is a cross between a Mandarin Orange and a Kumquat. It produces a small acidic orange that tastes similar to a lemon or lime. The juice can be used to flavor beverages, fish or soups, and can be made into sauces. Even if you don't care to eat the fruit, this citrus tree is still attractive as an ornamental plant. 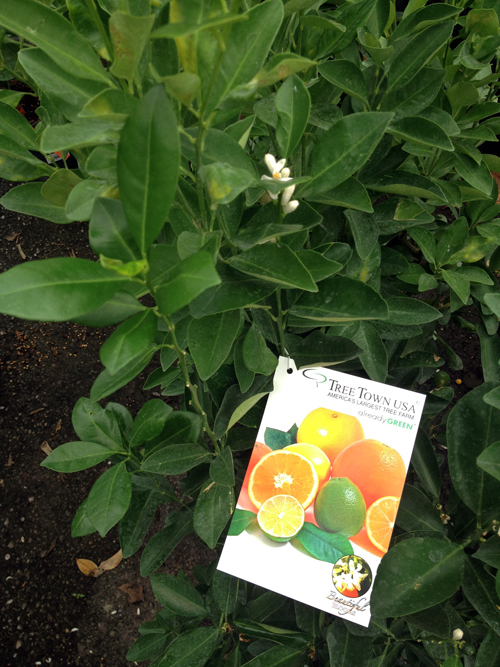 Before setting fruit, this citrus tree produces white fragrant blooms that appear year round! These plants can be grown in containers or in the ground. Some say they bring good luck when planted near the front door! Calamondin Oranges can be grown indoors with a good light source. When grown outside, give them full to partial sun. Calamondin can reach 10-20 feet in height, but can easily be pruned back to maintain s smaller size. Like other citrus trees, protect this plant in winter by watering and covering before a hard freeze.